Since I had the marzipan in my pantry I decided to go for it. This year I was also making my mom’s black and white cookies for Santa, they are such a yummy confection. The recipe I was using was by an Italian chef I really admire, Lidia Bastianich. She has some amazing recipes on her site and a popular PBS show called Lidia’s Italy. I would have to say it was not a hard recipe to complete but it did take a lot of steps and over a couple of days to complete. I would not have been able to do it without the help of my fabulous Italian sous chef, Gianna. 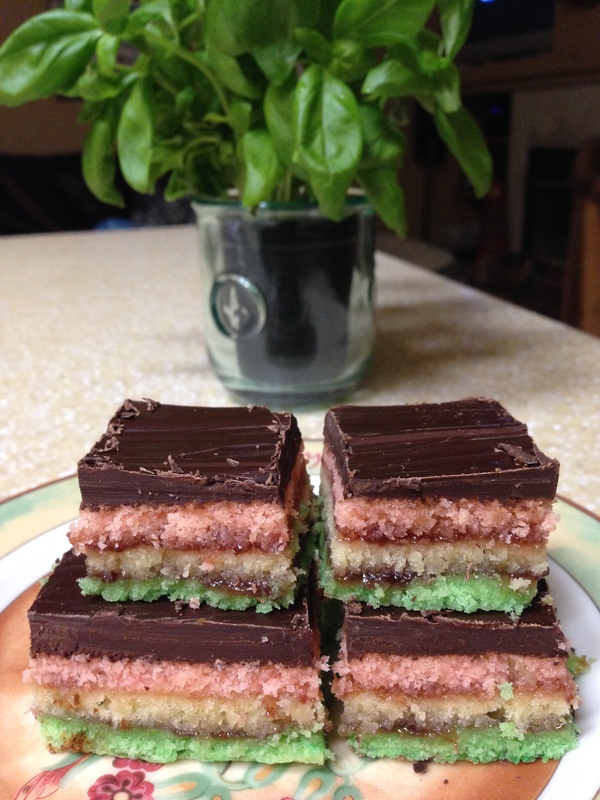 The end result was a Italian rainbow bar of decadence and scrumptiousness. Even my husband who is not a huge fan of marzipan or almond extracts, loved the cookies. The only thing we modified was to use strawberry jam instead of apricot to appease the little people in my house. I think this was a good marriage – think chocolate covered strawberries – so that flavor married well with the chocolate and almond. Also I used three 9×12 rimmed cookie sheets and barely had enough batter to fill those, so you might not need the bigger pans in the recipe. If you want to make some special treats for a holiday or event, let yourself be inspired by the Italian flag in this recipe. Preheat the oven to 350 degrees F. Butter and flour three 15-by-10-inch rimmed sheet pans (I used 9×12 ones) , and line the bottoms of the pans with parchment paper. Combine the almond paste and all but 2 tablespoons of the sugar in an electric mixer fitted with the paddle attachment. Mix on medium speed until you have fine crumbles. Add the butter, a few pieces at a time, and pulse until well mixed. Plop in the egg yolks, one at a time, and mix until the batter is smooth. Sprinkle in salt, and mix. Sift in flour, and mix until just combined. Whisk egg whites in a bowl until foamy. While whisking, slowly add the remaining 2 tablespoons sugar, and whisk until firm peaks form. Fold about a third of the egg whites into the batter to lighten it, then gently fold in remaining egg whites. Divide batter evenly into three bowls. Leave one bowl plain, without any coloring. Add red food coloring to one bowl, stirring to make a deep-salmon color. Add green food coloring to last bowl, stirring to make a medium-green color. Spread batter into each of the prepared pans with a spatula. Bake, rotating pans to opposite racks, until cakes are cooked through and just beginning to brown around the edges, about 8 to 10 minutes. Remove from oven, let cakes cool completely on wire racks, then remove from pans. Trim each of the layers to even out the thickness of the cakes. 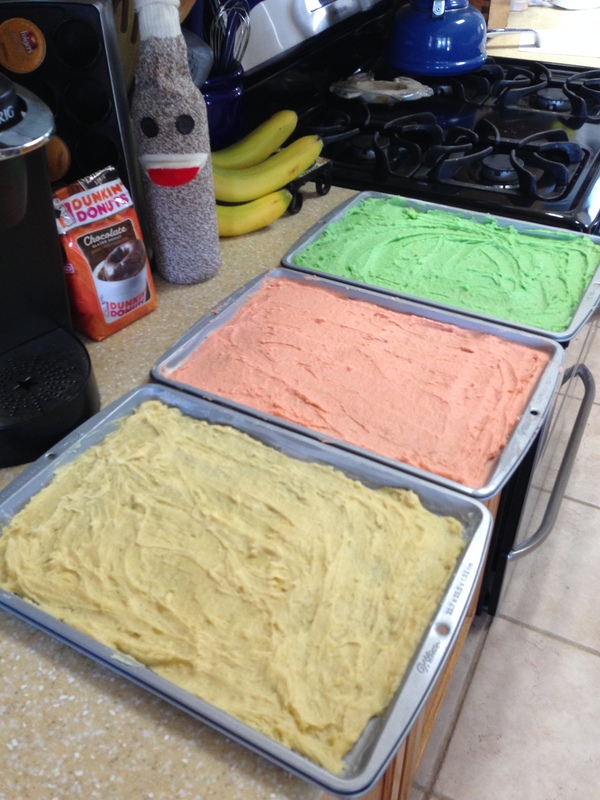 Put the green cake layer back, cut side up, into one of the lined pans. Spread one jar of jam over the cake, almost all of the way to the edges. Place the plain layer of cake on top of the jam. Spread the remaining jar of jam almost all the way to the edges of the plain layer. Place the red layer on top of the ham, cut side up. Wrap the entire cake in plastic, and top with another pan, weighted with cans. Chill in refrigerator 4 hours or overnight. Melt chocolate in a double boiler. Unwrap the cake, and place on a wire rack over a rimmed baking sheet. Pour and spread the chocolate over the top the cake, using a spatula to guide the chocolate over the top and down the sides of the cake. If the kitchen is cool, let the chocolate harden that way; if it is warm, clear a space in the refrigerator to place the cake and let the chocolate harden. When the chocolate is about halfway set, gently rake the topping with the tines of a fork or a dough scraper with dentals, starting from the end of the chocolate covering all the way to the other end, slightly undulating the lines as you move along. Repeat until all of the chocolate has indented stripes. Let the chocolate set completely. Using a serrated knife, cut the set and decorated layers into three dozen rectangles, using the outer sides to form perfectly cut rectangles. You are currently browsing the What Tara's Cookin' blog archives for December, 2013.